How Does A 2012 Tesla Model S Need An $8,500 Brake Job? The cost of owning a Tesla may shoot up as the years go on. One thing people don’t talk about much when it comes to Tesla is repair costs. Even the oldest Model S still isn’t very old, and since the car is electric many owners haven’t driven a ton of miles. 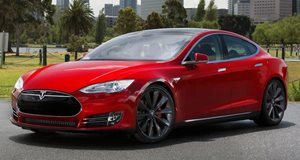 But one Model S owner in Canada may be the proverbial canary in the coal mine when it comes to future maintenance costs. to detail a brake job quoted at $8,5000. The EV was bought in December 2012 and has 64,000 miles on it. The car had been through two harsh winters and two warm ones. Apparently the pistons can seize if the brakes aren’t used enough, this neglect being caused by the regenerative braking system. Also the salt on the roads—the car is located somewhere near Toronto—can degrade the brakes further. Yes, the Model S is technically a luxury car but this is a steep bill to foot for something that's partially not the driver's fault (or at least not something a layman would think to watch out for). And the fact that you can’t exactly shop around for a Tesla mechanic exacerbates the problem. Hopefully Elon Musk is thinking about how to keep his used cars running .